... or, Macro bee different from micro. My blurb on how I think that the whole "economics is too complex to make neat mathematical models" argument really just tends to assume itself (i.e. the original meaning of question begging) was picked up over at Mike Norman Economics, where it was put in an interesting way. Sociologists et al say economists need to prove economics is not too complex to model and economists say sociologists et al need to prove it is too complex to model. That is to say we have sociologists and economists making a play for the null hypothesis. My personal view is that economists should get the null hypothesis in this case, but not for reasons that economists think they should. The key point is that (probably) the only way the actions of millions of complex humans can be aggregated in a tractable way is for the law of large numbers to kick in. In that case, the bulk properties of the state space tell us more about macroeconomic properties than the properties of the agents. 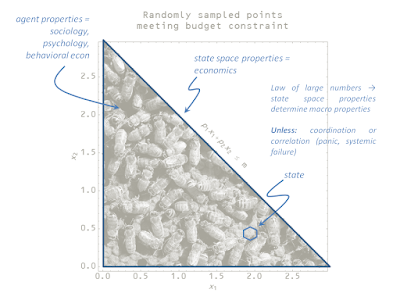 Also in that case, as long as the social science of the agents meets some pretty general constraints, there is a separation between the economics (study of the state space) and the social science (study of the agents). The mathematical laws of economics are emergent and (somewhat) independent of the social agent substrate. I borrowed a diagram from this post about how utility (a potentially measurable behavioral property of agents ) and entropy (a property of the bulk state space) can reproduce some of the same economic relationships ... and added bees. The bees in the graphic at the top of this post represent the agents, and the observed dances and other behaviors are the social science theory of the agents. The bulk properties of the hive (size of cells, size of hive) represent the economic theory. We can tell some things from the law of large numbers ... the size of a cell varies a bit, but the average size (for a given species) can be well known ... the number of bees gives us a good estimate of the size of the hive. These give us a good idea of honey output regardless of the individual dances telling us the direction to some flowers with tasty nectar. Large scale coordinations break down these relationships (e.g. colony collapse) . In my link above, there are some other things that give us more information. For example, in a d-dimensional beehive with d >> 1, nearly all the bees are near the surface, not the interior ... as long as they are not coordinated to be in the interior (say, by the queen). When this separation holds, then economics is more like physics. When it doesn't, economics is a social science. If the details of the complexity of bee social structure strongly mattered, it would (likely) be impossible to figure out how much honey you could get from N bees. Now humans are more complicated than bees, but the same principle -- that the macro properties are mostly governed by the bulk properties of the available state space -- has to apply if macro is tractable. And if it's not tractable (a possibility), then it really should just be moral and historical arguments. ... that turns out to not really be true of individual agents in many experiments. This is the case of non-ideal information transfer in the model. Unfortunately I can't seem to give you a link at a particular time (like I used to be able to do), but the relevant part (1 minute long) starts about 17:50 or so. "Sociologists et al say economists need to prove economics is not too complex to model and economists say sociologists et al need to prove it is too complex to model"
I agree with this but the question I would ask is who are the recipients of, and judges of, these proofs? In democracy, markets and trial by jury, it is the crowd which determines the winners. In a trial by jury you can't be a protagonist in the debate AND the judge who ensures fair play AND the jury which determines the winner. In social sciences it appears that each academic declares himself / herself the winner. Who do you think should be the arbiters in the debates between economists and sociologists? Maybe that's where evidence and prediction can play a role. If economists can build models that succeed at forecasting then that's the proof Jason was referring to, perhaps. Yes, Tom, forecasting would be a good discriminator. However I'd like to say that so-called 'hard' science proceeds exactly like this. Scientists are the judges, juries and plaintiffs. That's what the system of peer review is. But really he above 'battle' for the null hypothesis is really a battle between optimism and pessimism -- but with a twist! Social scientists are optimistic that humans *can't* be modeled by equations and economists are optimistic that humans *can* be modeled by equations. Social scientists see rational agents as dehumanizing and economists see rational agents as ennobling. And there isn't a right answer there. Economic agents are economic agents much like bees are bees. They aren't good or evil -- they just exist. "Social scientists are optimistic that humans *can't* be modeled by equations and economists are optimistic that humans *can* be modeled by equations." Also, there are some economists (or at least amateur economists) who are no fans of equations. Some of the Austrians would qualify from what I understand of them. Some Austrians are "optimistic" that economics is even impervious to science. Instead it requires sitting in an armchair and reasoning it all out from first principles. This is supposedly an "iron clad" approach making this form of Austrian econ bulletproof against all empirical evidence. Now I haven't spent even 1-minute reading the original Austrian texts, so I might be completely wrong there. That's the interpretation I get from websites like rationalwiki. However, I HAVE had encounters with "internet Austrians" which seemed consistent with that interpretation. ... not "William Stephenson" ... that should be "Stephen Williamson" ... ha! (what's funny is he criticized Nick Rowe in particular, who seems more willing to publicly dip his toe in the math pond than Sumner for example... go figure!). That may be true in the world of pure science where scientists are the only people involved. However, it’s not true in the wider economy. Peer review is what I would call internal review. That happens in business and government too. Suppliers aim to ensure that their products / services / ideas / policies meet a certain standard. What happens IN ADDITION in business and government is that customers apply a separate external review. I imagine that must be true in any applied science which is funded as well. If you have ever complained about a restaurant meal, or taken back a purchased product, or reviewed a purchase on Amazon then you are applying external quality assurance. For example, if most customers decide that company A’s product is very slightly better than company B’s product then company A will get the vast majority of sales. That is a brutal environment. The fact that company B has great internal quality processes is not relevant. It needs to get better to compete. Successful companies such as Apple are those whose internal quality processes at least match the external quality requirements of their customers. As a result, most customers are satisfied. On the other hand, the internal quality processes of the economics profession appear to be very poor. For example, they don’t even have consistent definitions of common terms such as ‘money’. They also split into tribes and don’t listen to criticisms from economists in different tribes. They also don’t attempt to explain their ideas to policy makers and the general public in plain English. They also appear to be politically motivated. As a result, their customers reject their advice as not fit for purpose. Economists don’t appear to understand this even though this is a very basic aspect of the real economy. It’s far more important that supply and demand curves. Charles Darwin was one of the greatest scientists of all time. All he did was to catalogue diversity and note that change was a constant process. He didn’t build mathematical models or make any specific forecasts. He would have failed your test. Also, mathematical models of what? Forecasting what? Most economic models forecast only that tomorrow’s economy will be the same as today’s give or take a little. That’s like a geologist forecasting that there won’t be a major earthquake in San Francisco tomorrow. It will be correct most of the time but it misses the point. And who decides which forecasts are useful? I would want, at least, a forecast which optimised economic growth against social cohesion and environmental stability i.e. I don’t agree with the basic premise that growth in GDP is the only objective of economics or economic forecasting. Forecasting is of limited value when we don’t even agree what we are trying to optimise. I do think that Jason’s forecasting techniques have the potential to replace mainstream techniques, and I also think that it is extremely interesting to see the mainstream reaction to the challenges Jason poses to their thinking. 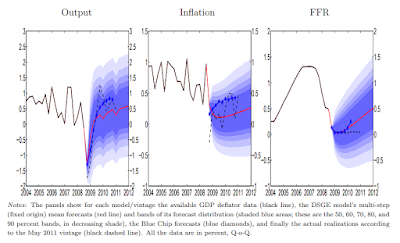 However, forecasting is not the main technical problem in economics. The technical problems are much more basic: no agreed scope or objectives; no agreed definitions of basic terms e.g. money, saving; no agreed classification system e.g. types of market; no agreement of what is, or is not, conserved under change; poor data measurement at a level of granularity so high and so infrequent that it’s impossible to determine causes and effects; insufficient historical data to assess trends, particularly for exceptional events such as major depressions; inability of economists to communicate with policy makers and ordinary people in plain English; and, of course, no agreed code of ethics. "Charles Darwin was one of the greatest scientists of all time. All he did was to catalogue diversity and note that change was a constant process. He didn’t build mathematical models or make any specific forecasts." Darwin personally didn't like math -- and as such we lost out. Darwin's inability (and lack of desire) to make mathematical arguments is not evidence of anything. It was a personal preference. Keynes didn't make very mathematical arguments in his general theory (there are a few generic ones), but it was Hick's version that is the common understanding today -- regardless of what Keynes said. Also, regarding your desire for forecasts of social cohesion and environmental stability -- that may be beyond the scope of economics. The seismologists that predict earthquakes aren't required to predict the death toll and the dollar amount of the damage. I think economic forecasts are limited to the macro aggregates in their purview. Other social scientists can take those aggregates and use them in a theory of social cohesion much like economists could take the output of a earthquake prediction and use it to figure out the dollar cost of the damage. Do counterintuitive economic results make sense? Is the endowment effect rational? Can we extrapolate growth into the distant past? Pegged interest rates = hyperinflation? So many monetary policy shocks! Mistakes, random behavior or complex behavior?